Mr. Ralph Aloiau was born in Kapaa, Kauai. He married Violet Loui and they both had 5 children. Ralph worked as an office manager for servicing appliances for W.A. Ramsey for 13 years and later at Sears for 23 years. After his retirement in 1972, Ralph and Violet traveled extensively. Following Mrs. Aloiau’s death in 1988, Ralph lived independently for many years. Then following several strokes, falls, and hospitalization, he was admitted to Leahi Hospital in August 2005. Mrs. Taka Sato was born in Hokkaido, Japan. She married in her mid 20s and had two daughters. Taka worked at her parent’s grocery store up to her retirement in the mid 1960s. During the late 1980s she relocated to Hawaii, through the invitation of her daughter Atsuko and son-in-law Paul Chun, and eventually was able to obtain her green card status in 1990. 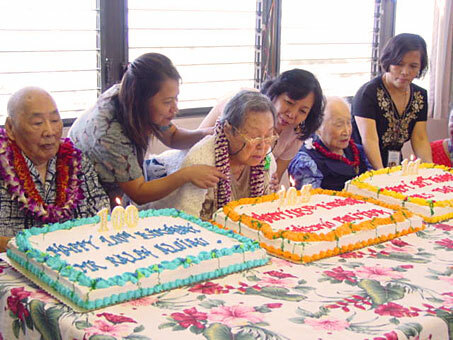 While in her mid 90s, Mrs. Sato’s physical strength weakened considerably, and subsequently was admitted to Leahi Hospital in May 2004. Mr. Shizuyo Moriyama was born in Haleiwa, Hawaii. After marrying Toshihiro Moriyama at age 21, they moved to Palama to care for his parents. They soon had two daughters. Mrs. Moriyama held several jobs throughout the years and ended up as an office nurse for a family physician. Unfortunately, her husband passed away unexpectedly in 1959. Following her retirement, Shizuyo helped baby sit her grandchildren, and traveled extensively with her friends. Mrs. Moriyama also loved to garden at her home in Liliha. In spite of a mild stroke in 1985, she continued with her daily routine. By age 102, Mrs. Moriyama became weaker and weaker, and her falls became more frequent. In November 2008, Shizuyo was admitted to Leahi Hospital. Leahi Hospital is one of 12 facilities operated and managed by the Hawaii Health Systems Corporation. Established in 1996, HHSC is a public benefit corporation of the State of Hawaii. As the state’s safety-net health care system, HHSC continues to fulfill the state’s promise to provide quality, hometown health care.